Artifacts are ancient items of significant power, fame, and historic relevance. Many artifacts appear to have a mind of their own, changing form and dispersing across Tamriel at random, never staying with one owner for long. The Daedric Princes of Oblivion are known to create artifacts from their own essences and gift these artifacts to mortals, spreading the princes' influence in return for their power; an example of such an artifact is Azura's Star. Not all artifacts are Daedric in nature or origin. 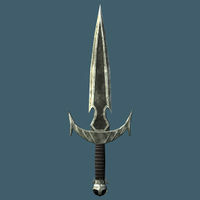 Some, such as the Staff of Magnus, date back to the creation of Mundus. Others, like Keening, were created by mortals. A few form naturally, such as the seven Star Teeth. Several artifacts, such as Volendrung, were originally created by mortals before they fell under Daedric influence. Artifacts are near-impossible to permanently destroy, and usually resurface in several years; notable exceptions include Fearstruck and Umbra. Most artifacts possess powerful enchantments, superior craftsmanship, or both. Artifacts come in many forms, including weapons, armor, rings, books, and mundane items. They often go by several names, and are well-known to the people of Tamriel. Daedric artifacts are predominately made of ebony. Doom-driven heroes are known to come into contact with many artifacts, and the prophecies of the Elder Scrolls sometimes relate to a specific artifact. This page was last modified on 11 September 2018, at 20:45.